Millennial Money is a personal finance and money management blog for Millennials written by Millennials. We are commonly known as the generation of people born between the years 1981 and 1997, this year Millennials will overtake the baby boomers as largest generation in United States history with 75.3 million people. We are the largest and most studied generation in history. 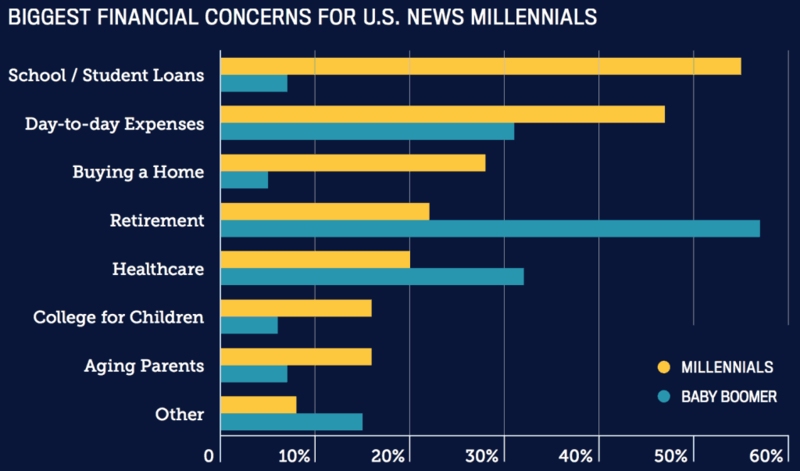 There have been hundred of studies specifically on how Millennials think about money. 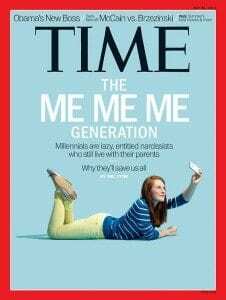 We are known as the Millennials, Generation Y, “The Me Me Me Generation,” and “the soccer trophy generation”. We have been labeled as “entitled” “narcissistic” “lazy” and even “delusional”, but we have also been described as being “entrepreneurial” “optimistic” and “idealistic”. No matter who we are as a generation, one thing is certain – as we enter our 20’s and 30’s and start to take over the workforce (now 1/3 of all workers in the United States are Millennials) we are turning the world into a radically different place. We have our own thoughts about careers, families, and values. Here is a look at how Millennials think – what we love, what we hate, and how we think about money. Massive Student Loan Debt: We could also be called the “student loan generation” and we have been crippled by debt. Student debt is widely referenced as our generation’s top financial concern and the average Millennial has $48,000 in student loan debt. The biggest driver of the student loan debt crisis has been the insane increases in college tuition costs over the past 10 years with the average cost of a college degree now is close to $30,000 per year and many are even higher. Many Millennials were forced to take out loans to pay for college and were hopeful that they would graduate and be able to enter into successful career tracks – but that largely hasn’t been the case and we have had a hard time paying off our student loans. Historically Low Wages: When this paired with the historically low wages that Millennials are being paid this makes for a very difficult situation for most Millennials. The average Millennial is underemployed and it is quite common to see Millennials who graduated with huge student loans making $12/hr in service jobs. Because of this student loan debt and low wages, as a generation we haven’t been saving money and recent surveys show we are worried about our ability to accumulate wealth. Spend money on experiences instead of things: When it comes to spending the money that we do have, we Millennials prefer to spend our money on “experiences” because they make us “happier” than material things.. This is unique to our generation. According to the report “Millennials: Fueling the Experience Economy” conducted by Eventbrite, Millennials have over $1.5 trillion dollars in purchasing power and “78% of us would prefer to spend money on events and experiences.” It’s not hard to see why there are more music festivals popping up every summer and big festivals like Coachella, Ultra, Lollapalooza, and many others sell out almost immediately. We are getting married and having kids later than any other generation: As Millennials we want to like our jobs and many of us are delaying getting married and having children because of them – either because we are focused on our careers or we don’t currently make enough money to afford having a child. According to recent research conducted by Goldman Sachs on the Millennials revealed the number of Millennials getting married before 30 is only 23% compared to 56% who were married by this age in 1968. We are also not only want to feel like we are appreciated and adding value, but we truly want to make the world a better place. This is reassuring because the world is going to need us – over the coming decades we will experience the increasing effects of global warming, increasing national debt, and an increasingly connected world. We want same day delivery within the hour and absolute convenience: We value convenience and “ease of use” and don’t mind sharing our cars as Uber drivers, our apartments on AirBnb, and even our time doing random tasks on TaskRabbit. We also want our groceries delivered – Instacart is a mobile grocery delivery app built for Millennials that is now filling millions of orders every week. As a generation we would rather spend our time having fun or hanging out rather than grocery shopping. Big brands are now taking notice as well – Google and Amazon now offer same day delivery on many products that we use in our everyday lives. We are digital nomads and entrepreneurial: Because so many jobs can be done online, we as a generation are becoming increasingly mobile in our careers. We are also launching our own companies. It seems like every Millennial over the age of 25 has read The 4-Hour Workweek: Escape 9-5, Live Anywhere, and Join the New Rich (Expanded and Updated) by Tim Ferris and have dreams of ditching the 9-5 lifestyle and launching a self-sustaining company. It is not uncommon to go abroad and see half of the coffeeshops full of expats doing their work from abroad – either on a full-time or part-time basis. For example if you have ever visited Chaing Mai in Thailand there are large groups of digital nomads from all over the world sitting on their computers making money online. I see them all the time in hostels and in airports traveling the world making a passive income from companies they have launched. We have a long investing horizon for our money to grow. Time is the most essential element to create wealth and as Millennials we have quite a bit of time for our investments to grow and compound into larger sums. 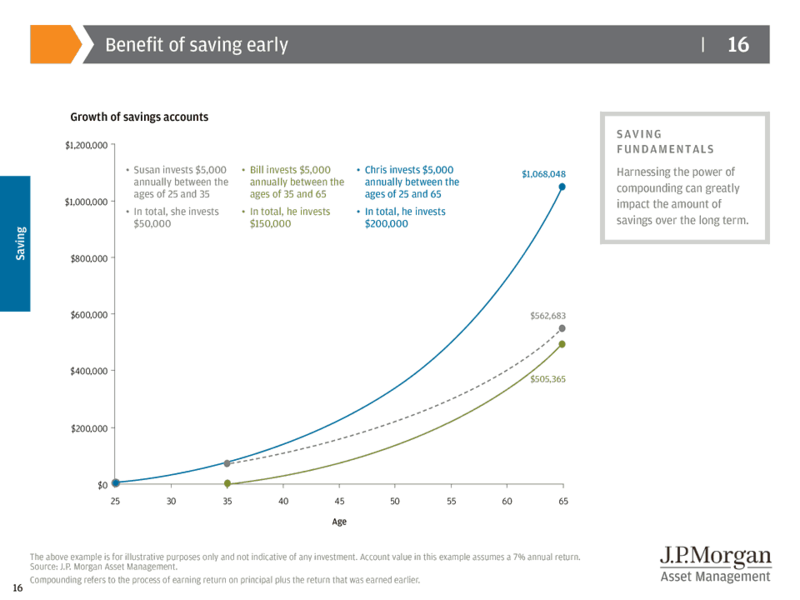 The rules of compounding interest are widely known and the earlier you start investing the longer your money has to grow. We have access to a wealth of high quality personal finance information online and free tools to support our financial goals. It wasn’t long ago that when you wanted to invest money you went and met with your banker or broker and they put your money into investments. Now the power and information is in your own hands so you can know how much money you have and make better decisions about how and where to save, invest, and spend your money. Can you imagine a world without Mint.com or Personal Capital? I can’t – it’s both annoying and helpful to have access to all of your financial information in your pocket at all times. And Mint is just the tip the iceberg – there are apps for budgeting, investing, and saving. There are also hundreds of thousands of helpful personal finance blogs and communities that are here to help you as well.